The oval medallion on the back of the armchair is draped with laurel, a symbol of victory. The medallions stars and stripes imitate those on the Great Seal, in which an eagle bears a shield with a blue horizontal field with 13 stars above 13 red-and-white vertical stripes. William Barton, one of the designers of the Seal, said the stars and the stripes represented the 13 original states, individually and as a confederation. The chair is also decorated with five pointed stars and acanthus leaves, reflective of classical Greek and Roman ornamentation. 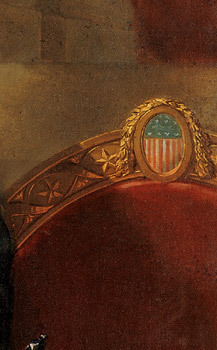 When Washington took up residence in New York, the nations capital, in 1789, he purchased from the Count de Moustier a Louis XVI armchair that had a rosette similar to those on the chair rail and the table in the painting.